Our enchanting "Spring in the Valley" jewelry set is sure to dazzle! 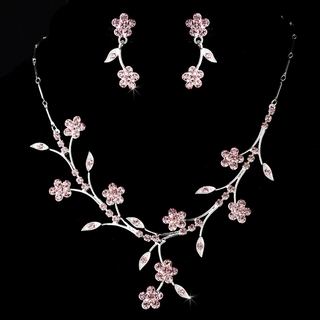 Sparkling pink rhinestones are arranged in a lovely floral design on this silver-plated necklace and earrings set. This set is perfect for brides and bridesmaids; it also makes a wonderful gift for birthdays and anniversaries! Size: The necklace measures 14-1/2" long with 3" extender and a lobster-claw clasp. The matching earrings measure 1" long.